Enterprise companies are hesitant to adopt SaaS platforms because they offer a standard product to all customers. In this article from Marketing Technology Insights magazine, we reveal why SaaS marketing systems are actually a major advantage for these large brands. Enterprises have been reluctant to give up control over their marketing software, instead using specialized IT resources to design software that’s custom-made. These custom systems are often expensive and inefficient, especially for marketing. 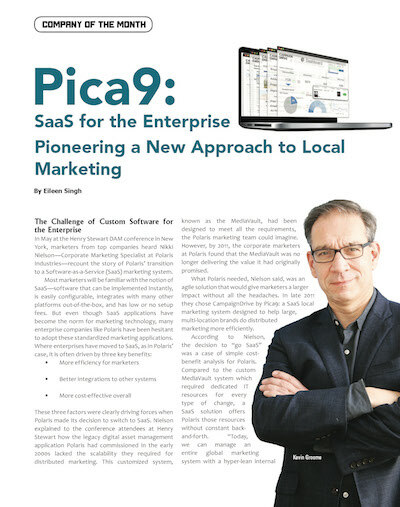 SaaS marketing software is now becoming a viable alternative for enterprise-level organizations. Self-service configuration, automatic system upgrades andbetter cost-effectiveness mean that enterprise marketing SaaS is the new standard for major distributed brands. Fill in the field below to read the study.